Before you buy a watch or clock, you want to consider the cost of ownership. For example, I read a great story in a horology forum on the internet, where someone presented a review about his new Vacheron Constantin. He had paid $8000 for it and described its technical details, presented with excellent photos, writing about how much he enjoyed wearing it. Five years later, his Vacheron needed to be serviced. Since he could not justify the expense of $750, though this was less than ten percent of the replacement cost, he found a watchmaker to service his Vacheron for a lower price. He may have thought that he could save money by hiring a watchmaker with less experience. His watch did not perform as expected after it was serviced, and the owner described in his review, after writing about how wonderful the watch was, that he had stopped wearing his watch and how he missed his watch so much. Millions of truly expensive Rolexes, Vacherons, Pateks, and other fine watches sit in jewelry boxes and safes because of this. An expensive timepiece in a box is quite simply a waste. You want to consider the overall cost of ownership in the long run before you invest in a fine watch or clock. There are several issues to consider, concerning parts and repairs, when searching for a watch. The first issue is age. Watches made before about 1900 are usually much more difficult to repair because manufacturers lacked good technology. Parts were fitted and finished by hand. Few watches had 17 or more jewels, so most have worn bushings that need repair. Repairs are usually difficult and expensive since many replacement parts are not available and must be custom-made. Most watches were not very accurate either. Many, however, were beautiful works of art that must be admired for the extraordinary craftsmanship and effort that were invested in their creation. Pocket watches made between about 1910 and 1960 did not lack, for the most part, the good technology needed to manufacture them. Parts that are available are easy to replace because they are interchangeable. 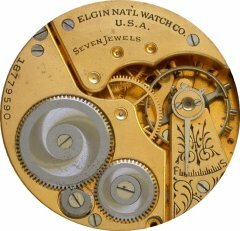 Elgin watch parts are widely available and easy to find, and these watches are not difficult to repair. Parts for European watches, however, are becoming more difficult to find. I therefore collect Elgin watches. However, Elgin watches were produced by the millions and their abundance makes them less desired by many collectors. Early wristwatches are usually difficult to get parts for and difficult to repair. After 1950, however, technology had improved considerably, and watches made since then are much more reliable and easier to repair. I prefer Swiss wristwatches made between 1965 and 1980. Most are not old enough to be collectible and can be found at very low prices. The use of white alloy hairsprings in modern watches dramatically improved their timekeeping. The use of shock absorbing jewels, such as the Incabloc System, dramatically improved their reliability. Look for watches having 17 or more jewels. Among less expensive watches, Swiss Ebauche watches (eg. ETA) are better than most. Ebauche companies made enormous quantities of these wristwatches for virtually all watch companies in all grades, from very inexpensive to highly-adjusted railroad grade. Many quality quartz watches were made between about 1978 and 1985 and these should not be ignored since many can be found today at very low prices (nobody seems to want them). If you pay very little for one, you would not lose much if the battery leaked or if the watch were not worth repairing once it no longer worked as it should. A watch with a battery that has the negative terminal away from the circuit board is less likely to be damaged by a leak. When looking for an inexpensive watch, whether mechanical or quartz, avoid "base metal bezel" (brass that is gold or chrome plated) and "stainless steel back" (which says that the rest of the watch is not made of stainless steel), choosing "stainless steel" and "all stainless steel" watch cases (or solid gold). Avoid watches in plastic or resin cases. One of the best quartz watches on the market is the Casio digital divers' watch (200 metres) in a stainless steel case and with a five-year lithium battery, despite its ugly appearance. Many quartz watches made after 1990 have plastic gears and plastic plates, which are difficult or impossible to repair, requiring that the mechanism be replaced with a new one. Plastic gears have a few advantages, (they weigh less, have lower manufacturing cost, and they are "self-lubricating"), but should be avoided. Plastic parts cannot perform well under load. In summary, do not invest much in a quartz timepiece and do not expect it to be worth repairing if it would not work with a new battery. Avoid expensive quartz watches. If you want a quality, investment-grade watch, buy a mechanical watch. A quartz watch in a gold case may look beautiful, but it is not a good investment. Some expensive mechanical watches may have beautiful gold cases but lower-grade mechanisms, so be sure that the grade of the mechanism matches the grade of the case (unless the price were low enough that it would not matter). Many higher grade watches, such as Omega, Longines, Rado, Mido, Cartier, and others, have "higher-grade" Ebauche mechanisms that are manufactured for these companies to their specifications. As a collector, I want Omega watches with Omega mechanisms, not Ebauche, unless the price were low enough. Having said that, many manufacturers, such as Rado and Cartier, have never made their own mechanisms. Replacement parts for all these brands are expensive. If you seek higher grade than these, like Rolex or above (Patek Philippe, Vacheron Constantin, Piaget, for example), repair costs and replacement parts become a major consideration in the decision whether to own one. The main differences between a lower grade and a higher grade watch is primarily in the hairspring and balance wheel, not in the rest of the watch mechanism, which is particularly obvious if you compare different ebauche movements. There are, however, some less expensive watches that perform exceptionally well. I have a Tissot from about 1969 that has a micrometric regulator on the balance bridge: though this Tissot is a lower-grade Omega (which owns Tissot), it is my most accurate mechanical watch. Avoid mechanical watches with stop-watches (chronographs). If you need a chronograph, use a digital quartz watch, which is inexpensive and works more accurately. Many mechanical chronographs are exceptionally difficult and expensive to repair. If you have a watch that has day, date, and automatic winding mechanism, and a chronograph, you will surely think twice before paying to have it disassembled and cleaned! Similarly, a quartz watch with an analog chronograph (that is, with conventional hands rather than being digital), is very difficult to repair and is usually repaired by having the entire mechanism replaced at considerable cost. Below is a photo of a Citizen analog quartz mechanism that has four motors (1-2-3-4!!!!). The paradox is that analog chronographs have become very popular, both as mechanical and quartz watches, because of their attractive appearance. Enjoy the photos of a Bulova Accutron. This extraordinary watch has a tuning fork, which you can see in the photos. The index wheel is only about two milimetres wide, yet it has about three hundred teeth! An incredible piece of engineering, the Bulova Accutron is exceptionally well made. Despite this, be cautious before buying one. The correct batteries (1.35 volts) are becoming difficult and expensive to obtain. If a watchmaker installs a 1.5 volt battery in your watch, it will probably ruin the coils (which have about 6000 and 7000 turns respectively!). Parts for Bulova Accutrons are becoming very scarce. Even more scarce are watchmakers willing to repair them. These unfortunate circumstances should not deter you from admiring one of the finest watches ever made (in my opinion). Nobody can write about watches without a few words about the most famous brand of all, Rolex. While some Rolex watches are absolutely superb, others are merely good, a fact about relative quality and performance that applies to all brands of watches and clocks (and cameras, cars, ...everything!). I have heard from many people that Rolex watches are overpriced, and that could be argued one way or the other. However, one Rolex seriously worth considering is the stainless-steel Rolex (or two-tone) with the #1570 movement that has the white alloy hairspring. As you will see among the photos below, this watch is a splendid piece of engineering. One caveat is that the hairspring is free-sprung, which means that it does not have an adjustable regulator, so all adjustments must be made with the timing screws on the balance wheel. This means that adjusting the timekeeping of this watch is much more difficult than it would be if it had a micrometric regulator like my Tissot. A more recent development of concern is the availability of parts. Since the year 2000, parts for name-brand watches have become difficult or impossible to find. If your watchmaker cannot buy the part, you must send your Rolex to the Rolex Service Center for repair. I saw a letter on the internet that was send to a customer in Spain, explaining that his Rolex was older than 25 years old and parts for it were being phased out. This development is a major concern for watch collectors and it applies not only to Rolex, but also to all the major brands. It took me two years to find a ratchet wheel for my Vacheron, and I had to order it from the UK. I hope that the information above is useful to you and that you will enjoy the photo gallery of watch mechanisms below. Most of the photos can be viewed enlarged: just click on each photo you would like to see enlarged (a new window will open). These enlargements are well worth seeing! You may copy these images for personal use, but not for use in any publication, magazine or book.